Okay, this is a different kind of post for me. If I had a cooking or gardening blog (which I do not), it would be more suitable there, but here goes nothing! Beets. They are absolutely gorgeous, aren’t they? 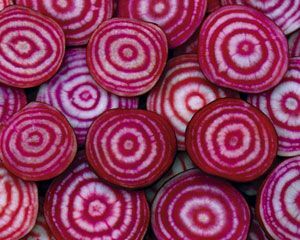 Those brilliant purple-red roots; or gold, or pink if you are lucky enough to spot a candycane beet from time to time, are so pretty I wish I liked to eat them. Now, if only they tasted as good as they look, all would be well. To me, though, they taste like dirt, or iron, coated in sugar. Not a pleasant thing at all. So, someone is bound to ask me why that is a problem for me, at 46? I am no longer the child of 9, sitting at the dinner table, fork hovering over that beautiful purple slice of vegetable that I will gag on as I try to eat it. One word: CSA. I have a membership to a CSA (community-sponsored agriculture), which gives me access to loads of fresh, organic, local produce. Unfortunately, that also includes beets. I love the greens. They are so good sautéed with a little olive oil and garlic. It is those jewel-toned roots I can’t stand. I cannot, however, throw out a vegetable which has been grown for consumption. My parents were depression babies, and the thought of all that waste would sicken them. Not to mention, they both liked beets, which is why I had to eat my “no thank you” helpings every summer, right from their garden. As an adult, I have overcome a lot of my food phobias. I now eat Brussels sprouts and eggplant, and have come to love their flavors. Not beets. 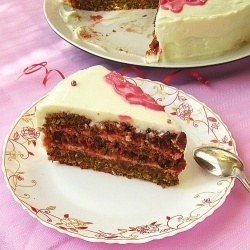 So, yesterday, in desperation, I looked up a recipe for a beet cake. Yes. A cake made from shredded raw beets. My theory was, if it tasted like a dirt cake with cream cheese frosting, all I had done was waste some sugar, eggs, and flour. Yum! This is not a picture of my actual cake–the camera is on the fritz. Heat oven to 350 °, grease and flour 13×9 baking pan. Beat eggs, sugar and oil until light and fluffy. Stir together flour, baking powder, baking soda and spices. Add to egg mixture and mix well. Add vanilla, beets, carrots and nuts. Beat for 1 minute on medium speed. Pour into pan, bake for 45 minutes, or until a pick comes out clean. This entry was posted in Uncategorized and tagged beet cake, beets, food, food aversions, food phobias, recipes, the poet turns foodie for a minute.. Bookmark the permalink. though I am not a fan of beets, this sounds yummy! Garden blog? Food blog? Who cares. Rules are for chumps. My folks were depression babies too. I grew up hating beets. The only way my mom made them was pickled. Yuck! My wife however makes a killer peasant-style borscht. It’s hot (not cold), chunky (not pureed), garlicky (not sweet), with lots of dill and veggies. Makes a beet a completely different beast. Great to see your words! Ooooh, JCC–would you or she be willing to share that recipe with me? 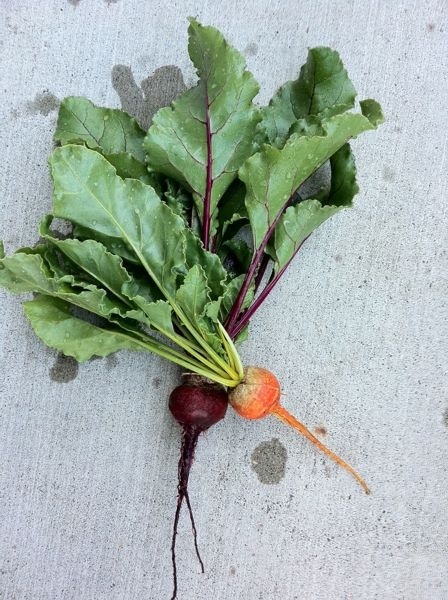 There are a lot more beets in my future this summer, as I have an addiction to the greens. Nice to hear from you, JCC. Missed you, and need to catch up on your poetry soon. They all sound like great things, and I am so happy for you guys. International laws re. mailing produce aside, I am going to try that soup recipe, if JCC’s wife will share the recipe. Not sure where my brain was but being new in the land of veggies and wanting to impress a second date…I grated beets and carrots, grilled the patties and served them in a toasted bun. 1 1/2 inches of juicy red something….you should have seen his face. Oh, my. How did it taste, and did you have a third date? Nah–smart man! I just wish I liked their taste–they are so damned pretty, and a superfood to boot. Great post Susan. Loved this different voice and look into another part of you! As for the cake… Mmmm sounds sorta funky but I trust your review. Besides how bad can something be with frosting? Then I will! It is such a huge part of summer living in this house, surprised I did not think to do it last year. Dude. Missed opportunity for poetry-recipe right there. It’s a new genre. I just invented it. But you should champion it. Ps I love beets. Aw, Trent! You need to teach me to appreciate these things better. I just like their look. Sigh. I have a primitive palate, after all. What a great idea–a poem with a recipe woven into it would be really, really cool. I will try one, I think. Giving someone a recipe for something exotic in poetry format. You will do much better than me, but just think of the cookbook possibilities! Get your poetry AND your recipes in the same place, that’s a guaranteed hit. Oh, do it! Make it one about beets, please! Nah nah more exotic, something curry-related maybe. Beets… love em but they’re kind of boring and there’s only so many ways of cooking them (that I’m familiar with anyway). Honestly. Beets are one of my favorite vegetables EVER. I LOVE that dirt taste. Yes. They taste like dirt and smell like dirt. YUM! I love them shredded raw in a salad, steamed or oven roasted. The French roast them in big batches and sell them loose from a pan at the market so you can get one or two at a time. If I lived near you, I’d be taking care of your beet problem single-handed for you. The only beets I don’t like are the commercial canned ones. This kills them. It destroys the dirt taste and makes them soft and watery. But perhaps I’ll make this cake when I have an oven again. Then I could get my 12 year old to eat them then. LOVED your kitchen/garden rant. Do more of this. Oh! Grated on a salad sounds wonderful! I might have to try it. I am also beginning to think my aversion has something to do with cooking them with the skin on, which is something I have always done. 😉 you would think, with all the time spent in it, I would like the taste. Curse my palate! Well, carrot cake taste nothing like carrots and zucchini bread taste nothing like zucchini so I guess this recipe could be pretty good! Tweeted in case others might like to try it. Since I’m gluten-free I’ll have to see if there is a good gluten-free flour that this would work with. Aw, thanks for the tweet, and I imagine any gluten free flour would work well here–I might cut down the shredded veggies a little bit, as it might come out too dense, or better yet, forget mixing the shredded veggies/nuts in with the mixer and just fold them in. Might help with that. And I’m 58. Anyone out there have a problem with my food choices? Eat what you like, and glad you liked the cake. love beets, love love the greens, and now a new way to try them. yummm. and follow up with our northern brother lewin…i want to see how that recipe poem works out…but he’s right..you’d rock at that! Thanks, Rhonda! We will see what obscure recipe I can conjure up from this week’s CSA bag (getting it today), and I will try the recipe-poem from that.